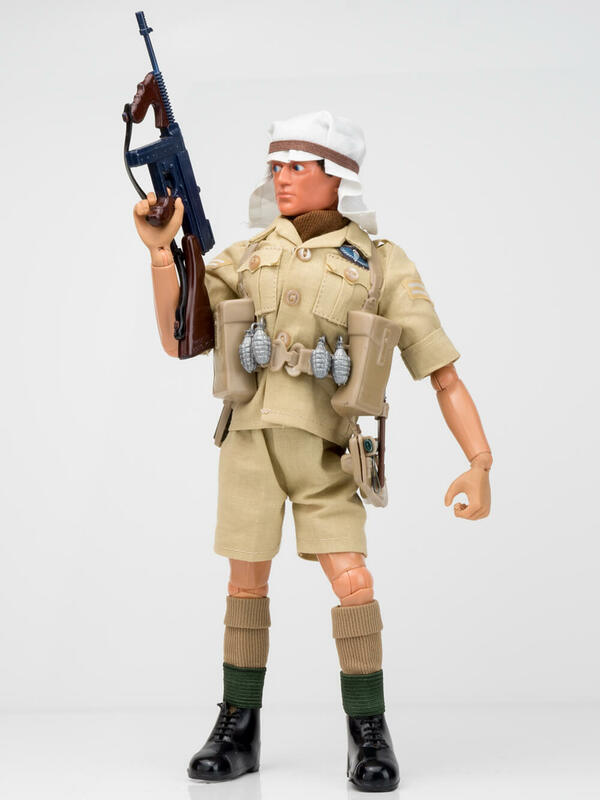 The Action Man Long Range Desert Group (based on the WWII reconnaissance and raiding unit of the British Army) was a excellently detailed swan song for the Action Man line of uniforms. 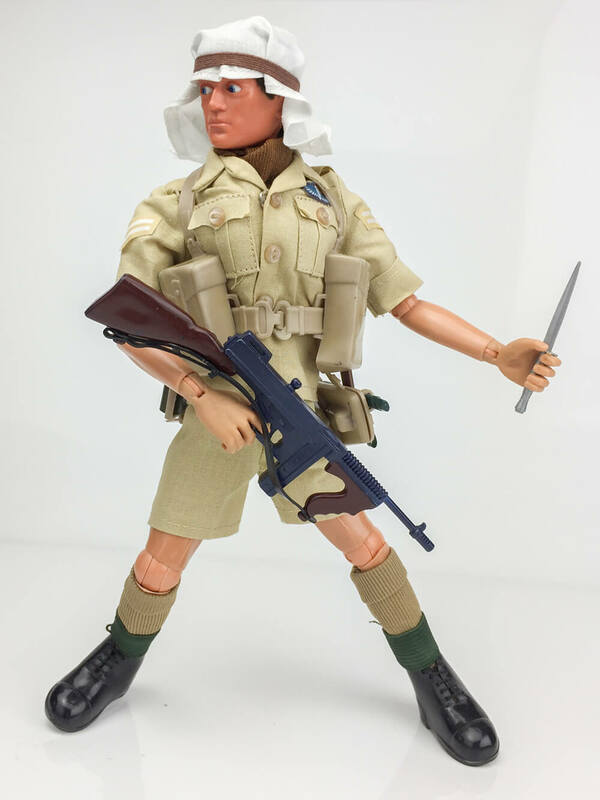 The plastic webbing was particularly comprehensive and included over and above other similar combinations, the entrenching tool head cover (this was omitted from the French Team Action Joe uniform of similar appearance). 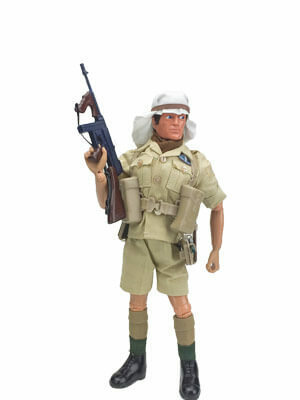 He was launched to take on his foe, the Afrika Korps figure(s). He came on the 'locker box' type of packaging. 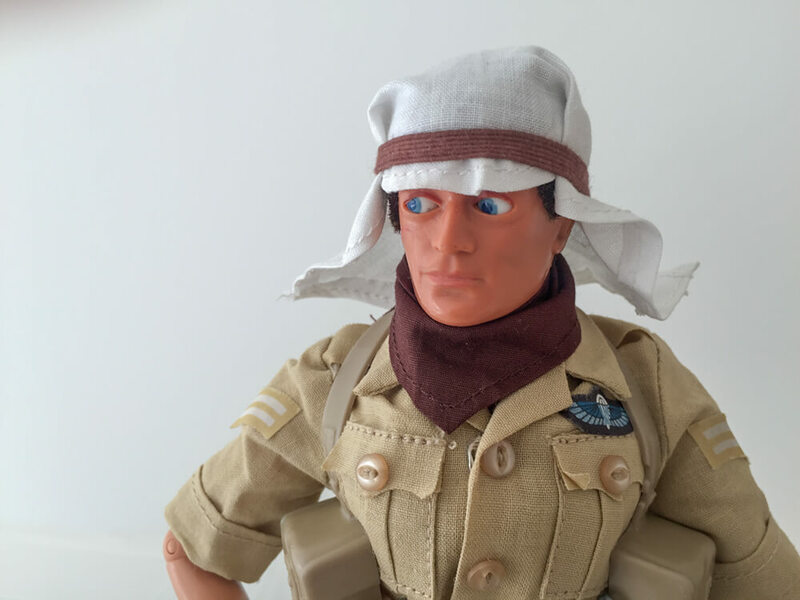 This LRDG corporal wears the parachute wings of the SAS (Special Air Service) sister unit to the SBS (Special Boat Service). 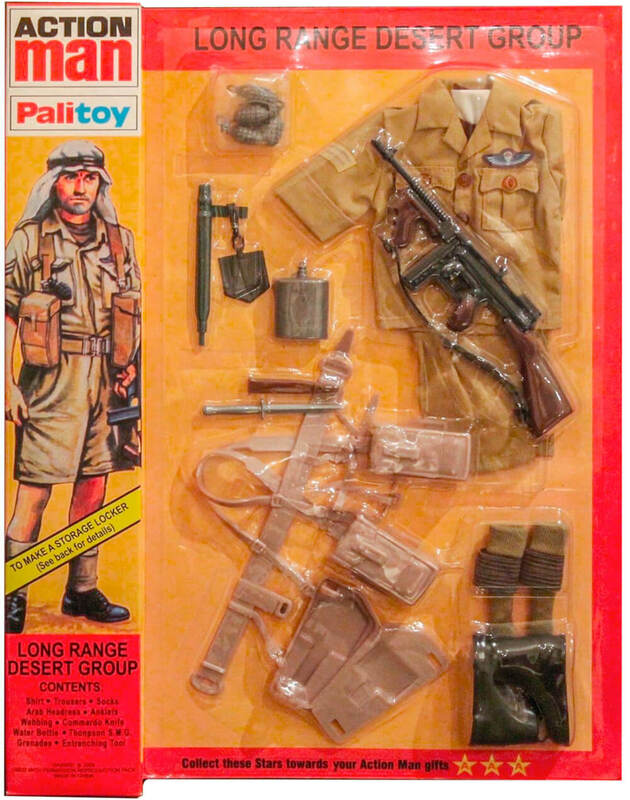 ACTION MAN LONG RANGE DESERT GROUP: Shirt, shorts, brown scarf, Arab headdress, plastic webbing, commando knife, scabbard, green handled entrenching tool, green water bottle, socks, 'anklets' (puttees), boots, 4 x grenades, Thompson sub machine gun, Equipment Manual. 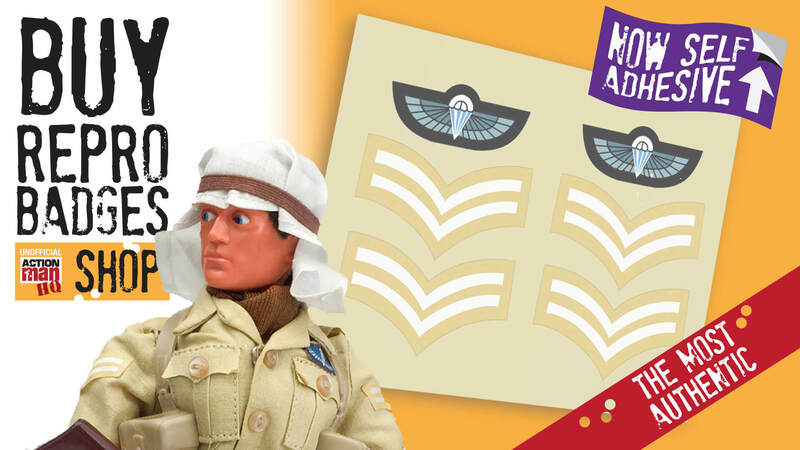 The Action Man Long Range Desert Group (or LRDG) uniform has silk printed insignia and corporal stripes on a short sleeved shirt. 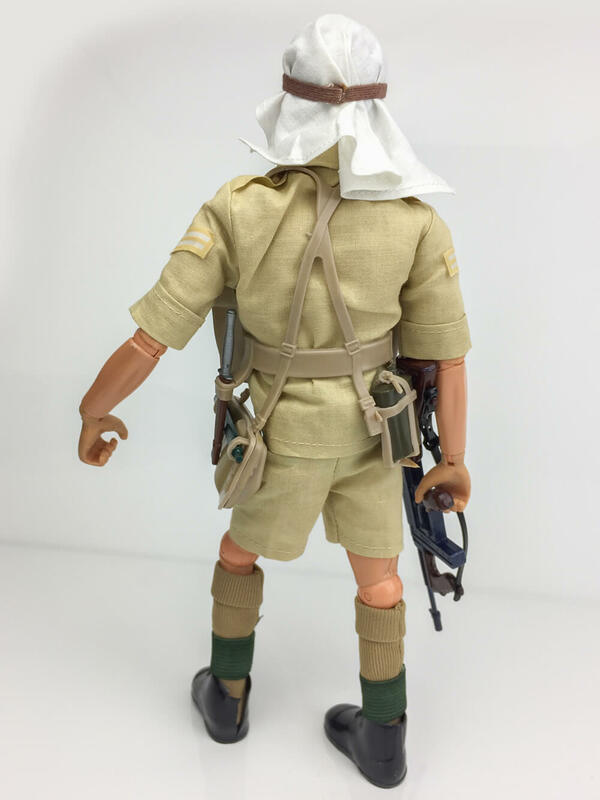 The socks are of a nylon type and sand in colour, but collectors have noted a more green-khaki also featured at some point (more akin to the green colour of Action Joe 'Commando Saharien' version). 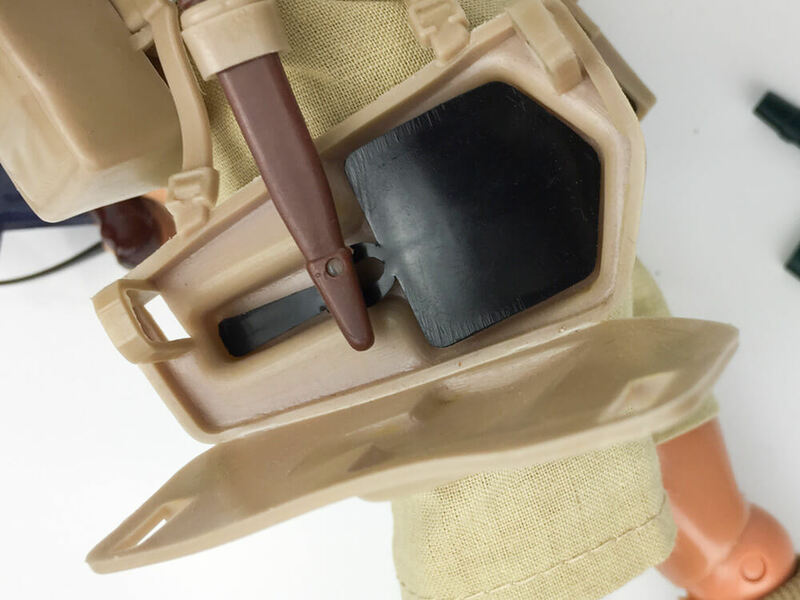 The webbing is unique to this figure, and includes more than the 'Royal Engineer' type by also including the entrenching tool cover, that is a hinged pouch, closed and sealed by the tool handle being slid through the two hoops shown in the images below. 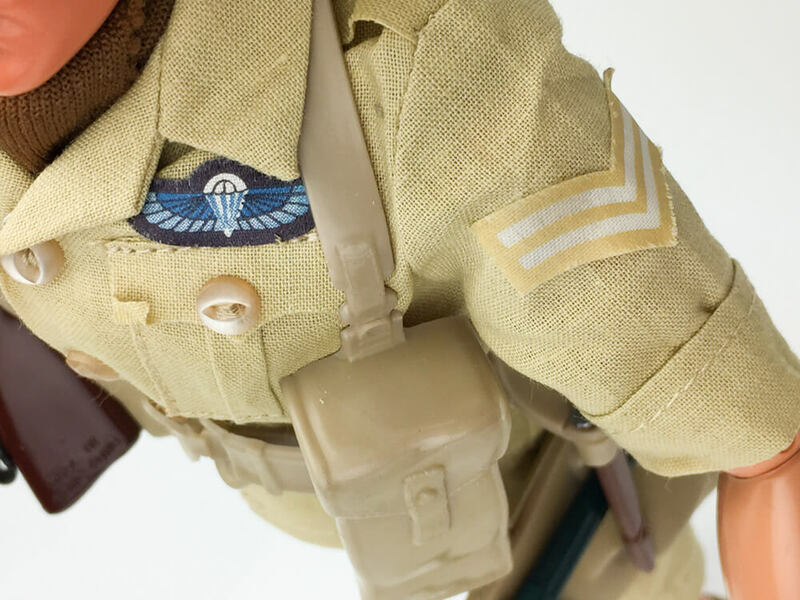 The silk type decals often go missing (buy repro here) as they are are victims of the light adhesive used like so many of the uniforms of this period. The 'Arab' headdress is two part - a white 'eye' shaped white cloth with dart to back, and a chestnut coloured elastic hard band. A similar brown triangular scarf was included (not the traditional long scarf of a similar colour shown currently in the majority of these pictures). 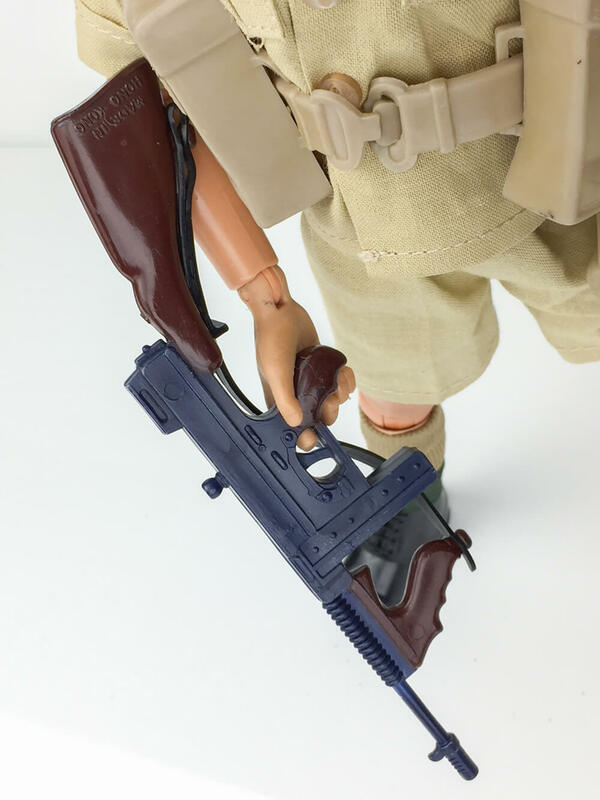 The Thompson sub machine gun has plastic strap and MADE IN HONG KONG raised lettering on the stock. 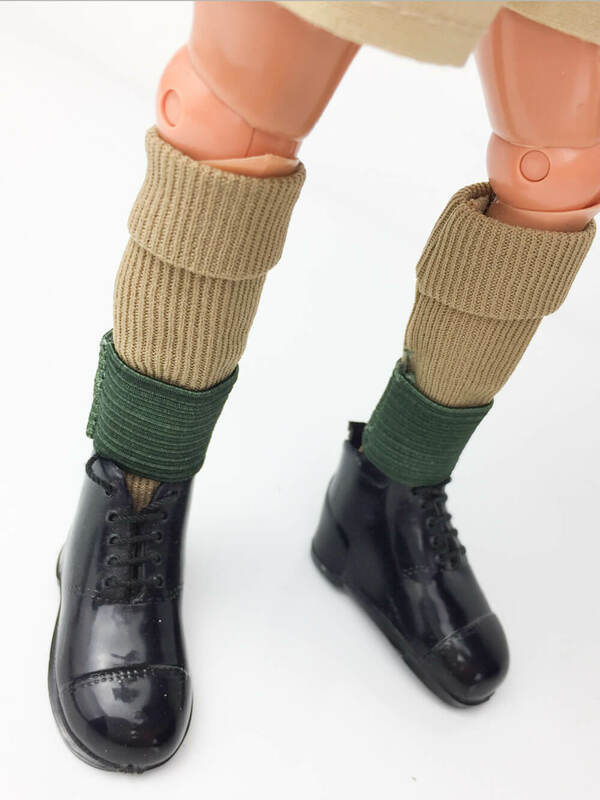 Boots are the late patent lace up type and puttees (or 'anklets') the familiar wide elastic type. The bayonet and scabbard are of the type issued to the Royal Engineer set. 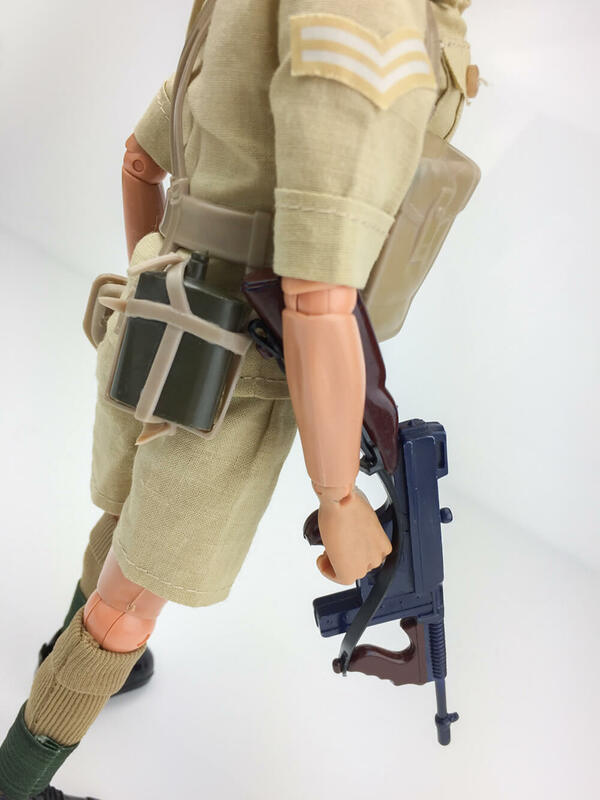 The water bottle is a olive green type (40th uses a silver version of the British Infantryman type in its reproduction set). Green tinted sand goggles look good and are often accessorised into this set, along with a bearded figure, as this is one of the few sets that favor the adventurers facial hair. The uniform can be considered difficult to piece together or find in complete condition. 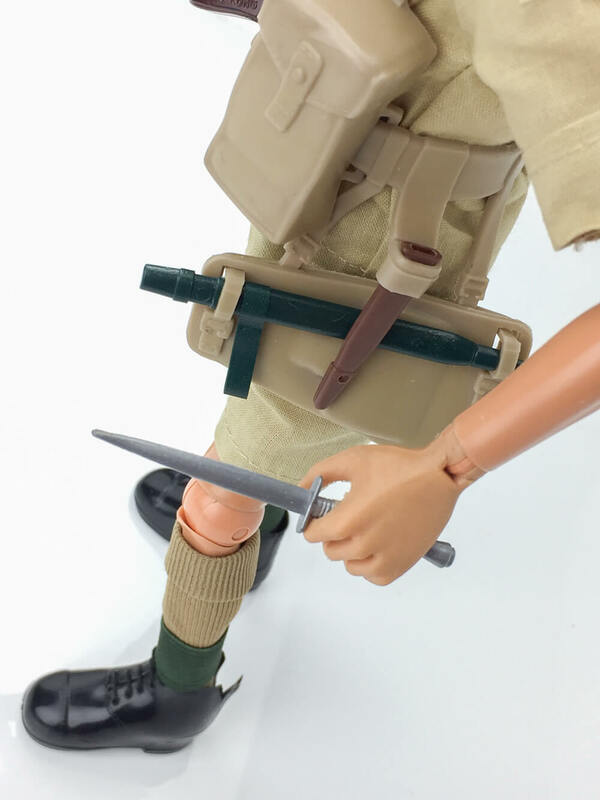 The shirt and shorts in these images are the identical Action Joe version (includes such label in collar). This set was also part of the 40th Annivesary release in 2006-2010 so beware very clean examples.